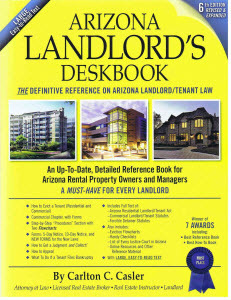 Arizona Landlord Tenant Blog: What is the maximum security deposit a landlord may collect? My rent is $1300 a month. In my rental agreement, my landlord assessed deposits for $650 for security, $650 for cleaning deposit(not listed as nonrefundable, but the agreement does say a portion will be withheld for carpet cleaning at the end of the lease) and a $750 pet deposit. All amounts are specifically listed as deposits. There are no amounts listed under non-refundable). By my math that's $100 more than 1 and a half month's rent. Are there any remedies? Response by Carlton C. Casler: The maximum refundable deposit your landlord could lawfully collect was $1,950 ($1,300 x 1.5). Your landlord collected $2,050, but you said “a portion” of the $650 cleaning deposit is nonrefundable, although the amount of the non-refundable portion is not specified in the lease. Nevertheless, your landlord can easily claim that $100 is nonrefundable, thereby bringing him into compliance with the applicable statute (A.R.S. Section 33-1321). Some judges will find that satisfactory, other judges may not find that acceptable and order him to refund $100, but (to me) that seems like a lot of your time and effort for only $100. Response by Carlton C. Casler: The first month's rent is not included in the calculation. The pet "fee" is not included. The maximum your landlord can collect for a security deposit is $1,800 ($1,200 rent per month x 1.5). Send a letter to your landlord requesting return of $600 because he collected more deposit than allowed by law. If he refuses, let me know. Mr. Casler, my situation involves the following: Monthly Rent: $800. Landlord requirement to move in: First month, last month and $1000.00 "SECURITY DEPOSIT" (Noted in lease and no mention of non-refundable mentioned). We were not aware of the law so we paid what she required when we moved in 10 months ago. I have given her a demand letter asking for return of $800 in accordance with the law. She has refunded the $800 but insists it is a return of the "last month" rent and not the security deposit. Does she have the right to determine where the overpayment is to be applied? Thank you in advance. Regards, JNM, Phoenix. Response by Carlton C. Casler. Yes. People, including landlords and tenants, make mistakes. This is one of the reasons the Act requires one party to notify the other party before taking legal action – it gives the offending party the chance to research the law and reevaluate the action they have taken. In this case, you notified your landlord that she unlawfully collected too much in deposits. She responded by returning a portion of your deposits – the portion that was initially earmarked for the last month’s rent. All people (and judges) will agree that a landlord may collect the first month’s rent and a security deposit. Consequently, if the landlord erroneously collects the first month’s rent, a security deposit AND the last month’s rent (the latter being unlawful under the Act), then the landlord may cure this violation of the Act by refunding the last month’s rent that was unlawfully collected. While it is true that should could have refunded the security deposit and retained the last month’s rent, it is equally true that she could have collected just the first month’s rent and the last month’s rent and no security deposit. Her actions comply with the Act. How does last months rent figure into security deposits? For instance move in costs are: $895 1st months rent (this includes tax), last months rent $895, $875 security (the only thing they call "security deposit") $250 cleaning deposit. Response by Carlton C. Casler. The Act limits "security" to an amount equal to one and one-half month's rent. For example, if rent is $1,000 per month, the maximum "security" a landlord may lawfully collect is $1,500. "Security" includes any type of deposit that the tenant can get back after tenancy terminates, including the security deposit, cleaning deposit, key deposit, pet deposit, etc. Anything that is a "deposit" that will be refunded to the tenant (provided certain criteria is met) is "security," as well as the last month's rent, which is also considered "security" under the Act. (See ARS Sections 33-1321(A) and 33-1310(14)). The first month's rent is not "security" because it is due now. From the figures given in your question, your landlord has collected more "security" than is permitted under the Act. You may lawfully demand (in writing, of course) that the amount exceeding one and one-half month's rent be refunded.